Metal Monkey here, back (finally!) with a review of an exciting new line of mini-figures called DOOM Götter (or Doom gods) by Imperfecz Toys and Ironhaus Prods. And let me tell you, these figures are nothing short of amazing! Here we have some background on the story behind DOOM Götter, sourced directly from the Imperfecz store. ‘In another dimension, all the creatures of mythology, ghosts, monsters, spirits from this world exist as monolithic kaiju-like creatures. Massive, building destroying, creatures battling within the city! So, Doom Götter essentially is a blend between Japanese Yokai folklore & the Dai Kaiju creatures from films and TV with mini-figures much like Keshigomu in Japan. We get the hint that future series may not be based on Yokai creatures, but the Dai Kaiju theme seems to be the predominant feature of this line. First up, we have two figures on offer, namely Akaname & Bake-Kujira. The contents of two individual packs, Akaname & Bake-Kujira with come with 2 buildings included per pack. The figures themselves are cast of a pliable rubber, somewhat softer than even Monster In My Pocket, and have a very nice feel to them. The buildings are cast of a more sturdier resin and seem to have a much more inorganic feel to them then the figures do, which is a really nice idea and contrasts perfectly with the figures themselves. Bake-Kujira – Standing in around 1” tall and sculpted by none other than Jimmy Rommel of Ironhaus Prods. Bake-Kujira is a monstrous whale kaiju that looks decayed, with his skeleton clearly visible. Bake or Bakemono (化物) is the Japanese word for 'Ghost' and Kujira (クジラ) translates as 'whale', so we get Ghost-Whale; a reanimated skeletal specter of a deceased whale. Back view of the two figures. Akaname – weighing in at 1.5” tall and sculpted by Luke Harris of Imperfecz Toys, Akaname (あかなめ) translates to mean ‘filth licker’ and upon reading of this creature for the first time, one can’t help but cringe at what one learns. It has a gaping tongue that it uses to consume slime, mold, human waste… yep, this thing is gross and that’s what makes it really awesome! Its naked, and has a mop of hair from the top of it’s head with no eyes visible, making it rely on using it’s tongue to navigate. Creepy, and yet so good at the same time! Buildings - In addition to these two mini-figures, there are buildings available for purchase separately in either 5 or 10-packs, perfect for building your own little city for these (and even other) awesome minis to play around in or display. I picked up a 10-pack and it did not disappoint! This is a really original and novel way of making mini-figures even more fun, and really adds the neat element of representing the mini-figures as Dai Kaiju, or monolithic, collosal beasts! The proportions are really spot-on, and immediately one gets a real proportionate sense of their size simply by to the buildings surrounding them. What’s great about these is that some of the buildings are intact, whereas others have been crushed/smashed by the Dai Kaiju in battle, and have a ruined, dilapidated look to them. You would have to be out of your mind not to appreciate having a mini semi-destroyed cityscape diorama for your mini-figures. It’s just such a good idea, and adds a lot of fun! Packaging for individual figure packs. 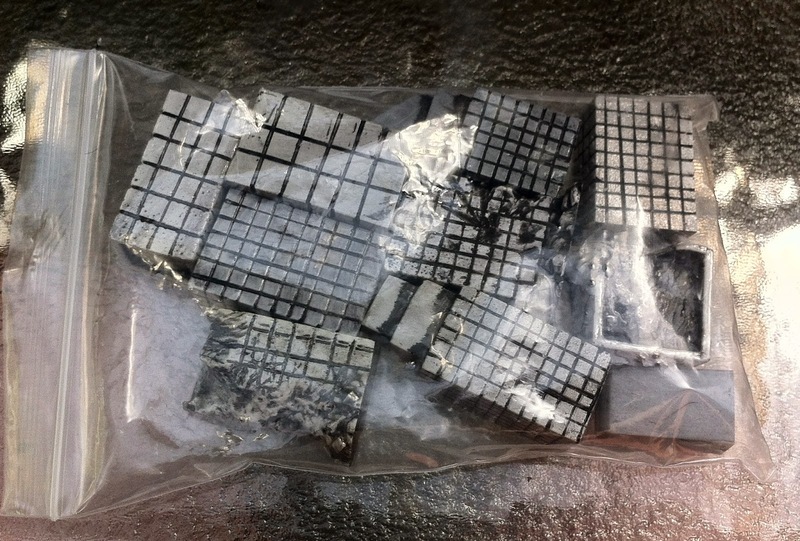 Packaging – Exactly what you would expect from this sort of thing, the figures come individually bagged, as do the 2 buildings that come included with each figure (Brilliant!) complete with a header card. The header card itself is quite simplistic, and has a fair bit of punch as the colors make it pleasing to the eye. Pricing – This is where it gets good, toy people. The pricing on these guys is really modest and affordable, so you can pick up figures in multiple colors and/or some extra buildings to add to your city. Another added feature to the figures, is that for an additional $1 per figure you can give your mini-figures a makeover with a BLACK WASH to really bring out all the amazing details from each figure. I’m so glad I chose this option, as the figures themselves look incredible with the two-tone effect as you can see by the pics. Shipping – I live in Australia, and these figures are made in the US. I’ve often paid exorbitant prices on shipping for items to and from Oz from ebay and some online stores but Doom Götter ships at a really nice low flat-rate internationally, so I was stoked to be able to get more buildings as it cost me less to have it shipped here. I could only imagine local shipping to be even less! Excellent. Sculpts- The sculpts themselves are really clean, and overall very nice! The textures are what you would expect for bones, skin, teeth and hair, etc. and really bring the figures to life. They aren’t saturated in too much detail and there seems to be a good balance of detail/simplicity. The proportions are fun and in the end these figures are quite charming, regardless of being creepy creatures. TowPlayability/Display – Bonus points for playability! The added buildings that make up the mini cityscape diorama really add a HUGE amount of fun for these figures. Whereas stand-alone figures display okay on their own, these have much more playability value to them. They also add more playability to your other mini-figures, as you’ll want to take your favorite figure to take a stroll downtown and lay waste to both the city and anyone foolish enough to get in your way! (Insert random monster noises here). Needless to say, they display great! You can custom build your own city based on how much display space you have, which is useful if you’ve got little space available. Availability – These have been available for a few weeks as of writing this blog review. Some colors are completely sold out, but there are still a nice variety to choose form. Check out the Imperfecz online store HERE! The only place you can pick these up as of now. Who will walk away the victor? Conclusion – Simply awesome!! DOOM Götter has practically instantly shot up to being one of my favourite indie toy lines ever, possibly rivaling Universe of Violence for my top spot, which is no easy feat. As a huge fan of the Dai Kaiju genre and folklore/mythology, as well as mini-figures in general, this just ticks all the boxes for me! I’m giving it an overall 9.5/10 and two HUGE thumbs up. 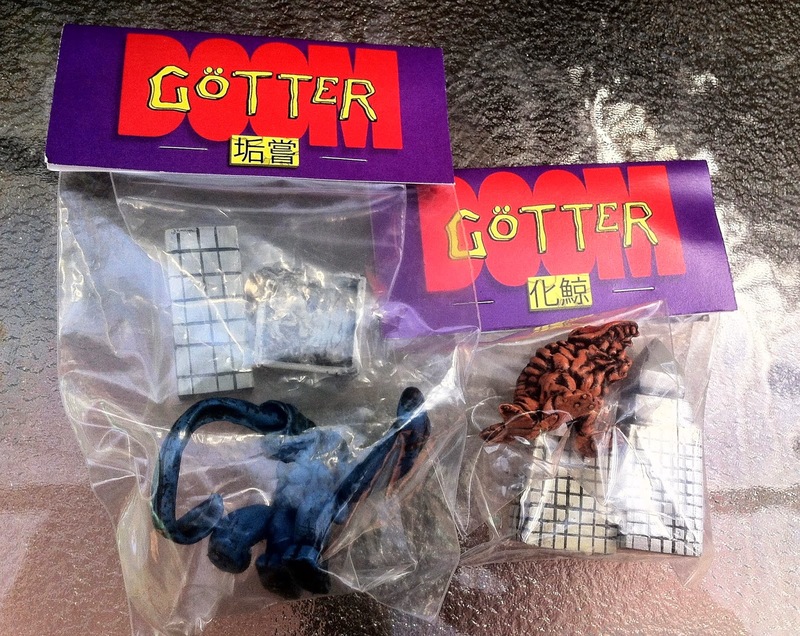 If you're into mini-figures then show some support by picking up some Doom Götter figures! You won't be disappointed, I promise you, and by getting behind this amazing new line we can expect to get more future releases of these badass beasties! I would love to see some tiny Ships, Trucks, Tanks, hell even a railway made available in future releases, in addition to other new monstrous creatures of course! Excited to see where DOOM Götter goes from here, watch this space for future news and reviews. That’s all from me, for now Toy People! Thanks for reading. Ironhaus Productions Oz is dedicated to making original custom monster toys reminiscent of 80's style mini-figures and Japanese Keshi. Please follow us or comment as we would like to hear from you! All photos are original unless otherwise noted.